Fifteen local artists from Kanimbla to State Mine are opening their studios on the weekend of 5-6 November. Enjoy visiting the studios, workshops and gardens, join in some art making, watch some demonstrations, maybe bag a bargain, enjoy yummy arvo tea and see some artists in their natural habitats. 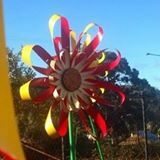 For more details call Annie Joseph on 0418 117 743 or check out the Lithgow Hartley Artists in Action Facebook Page.